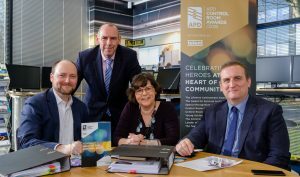 The judging panel for the APD Control Room Awards, from L to R: Mike Isherwood, Ian Thompson, Sue Noyes and Barry Zielinski. Chris Dreyfuss-Gibson and Cheryl Rolph OBE participated in the judging remotely. Finalists have been announced for the APD Control Room Awards 2018, which take place on 8 March. The awards are the first to recognise and celebrate the life-saving and life-changing work of staff in control rooms within emergency services and critical control operations across the UK. The winners will be announced at a ceremony on 8 March at the De Vere Orchard Hotel in Nottingham. Follow the awards on Facebook: @controlroomawards, Twitter: @CR_Awards and LinkedIn: Control Room Awards.